Kennedy & Wilson Chocolates are proud of our award winning chocolate couvertures, developed in the heart of the Yarra Valley. Kennedy & Wilson milk couverture is unique. Unlike most other Milk Chocolates, it has a high cocoa content and correspondingly low sugar content. It is truly 'All About the Chocolate'. Our signature milk chocolate also has high cocoa butter content and high dairy fat content. It has an incredibly smooth texture and true melt-in-the-mouth quality. It is ideal for patisserie needs, great in ganaches and also an irresistible eating chocolate. The high cocoa butter content enables thin, crisp praline shells. A full flavoured Milk Chocolate. Mid brown in colour with strong warm-cocoa and caramel notes on the nose. The palate shows distinctive malted-milk & caramel-mocha flavours with nuances of salt, and cinnamon. The ultra-smooth texture/mouthfeel leads to a balanced finish with a satisfyingly lingering aftertaste. 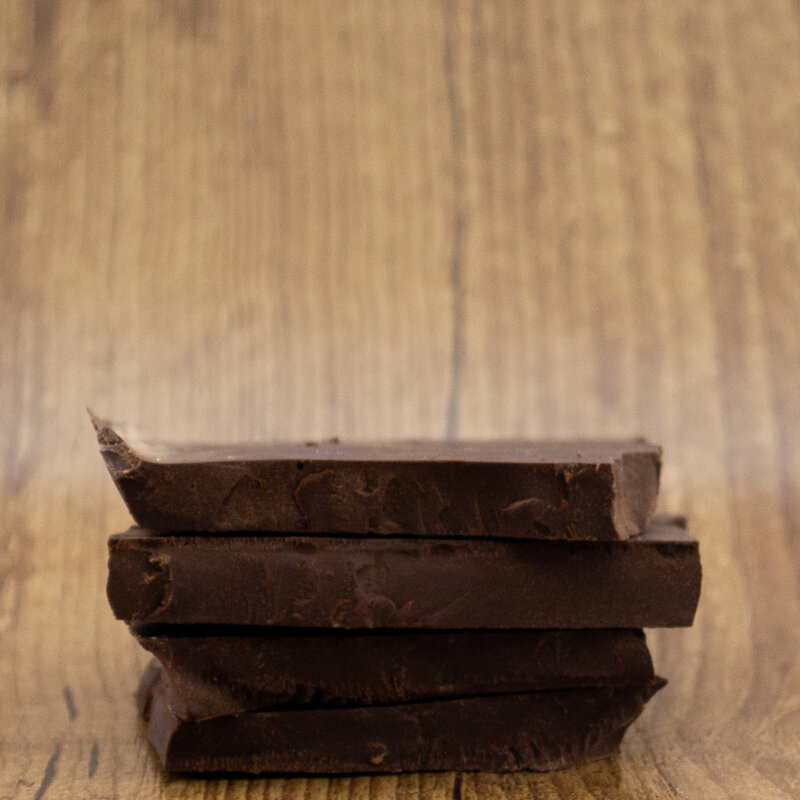 Many consider 70% to be the ideal cocoa content for Dark Chocolate. This of course depends on the cocoa origin as well as the cocoa butter content. The Kennedy & Wilson 70% Dark Couverture Chocolate is truly versatile. It is ideal for patisserie needs, great in savoury dishes and also an irresistible eating chocolate. The high cocoa butter content enables thin, crisp and glossy praline shells. A full flavoured Dark Chocolate. Dark brown in colour with strong classic chocolatey notes on the nose. The palate shows distinctive earthy & mocha flavours with nuances of iodine, cigar box and coconut. A sophisticated couverture for those times when intensity of flavour is of utmost importance. Our extra-dark chocolate 81% cocoa blend has intense cocoa flavour with considerably lower sugar content compared to standard dark chocolate. The true character of the cocoa shine through, enhanced by subtle vanilla elements. The Kennedy & Wilson 81% dark couverture chocolate is truly versatile; ideal for most patisserie needs, great in savoury dishes and also an irresistible eating chocolate. The thin, crispy, glossy praline shells. A concentrated and full flavoured dark chocolate, dark brown in colour with strong cocoa notes on the nose. The palate exhibits intense and complex flavours showcasing the cocoa, with vanilla, coffee, tobacco and notes of red-fruits & coconut. The ultra smooth texture/mouthfeel leads to a long-lasting aftertaste. A truly versatile Dark Chocolate. Pure and intense Chocolate flavour. Create sophisticated and balanced dishes by incorporating unsweetened Chocolate, then balance flavours using alternative sweeteners such as Treacle, Cassonade Sugar or liquers such as Bicerin. Perfect for dishes containing game or for intense Mexican Mole's. The essential ingredient for brownies. An intense Dark Chocolate, dark brown-black in colour with strong floral and nut aromas. The palate shows concentrated cocoa flavours with complex fruity tobacco and savoury biscuit characters. A long aftertaste with a pleasing balance of bitterness and acid. Kennedy & Wilson White Chocolate is a beautifully balanced chocolate with the emphasis on creamy vanilla flavours (rather than the flavours of sugar and skim milk). Our signature White Chocolate has a high cocoa butter content, high dairy fat content and correspondingly low sugar content. This allows the "hero" flavours of cream and vanilla to dominate. The palate has a super smooth texture and persistent aftertaste of caramel with a touch of salt to round out the finish. A full flavoured white chocolate, pale yellow-cream in colour with strong caramel, vanilla & dairy-cream notes on the nose. The palate shows distinctive cream & caramel flavours with strong vanilla elements and nuances of salt. The super-smooth texture/mouthfeel leads to a balanced finish with a satisfyingly lingering aftertaste.